Parking.com offers convenient and affordable parking to passengers sailing out of Cape Liberty Cruise Port. Save on short-term and long-term parking while traveling on the Anthem of the Seas, Rhapsody of the Seas, Celebrity Summit, Mein Schiff 6, or Azamara Quest. 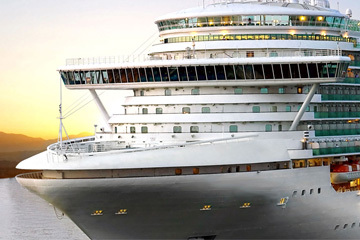 A safe, secure parking facility is conveniently located adjacent to the cruise terminal. Parking is available for $20 a day (tax included) to passengers, or $7 for up to 6 hours to pre-approved day visitors. Oversized vehicles, such as trailers, mobile homes, and buses will be charged double the normal rate. Refer to the map below for more information on parking. Cape Liberty Cruise Port is located on The Peninsula at Bayonne Harbor, just seven miles south of Manhattan, and is easily accesible via the New Jersey Turnpike (Exit 14A).